How to care purebred German shepherd puppies ? HomeHow to care purebred German shepherd puppies ? A German shepherd is the most devoted and affectionate breed of dogs and they require love and care from their master and family. Before owning or buy a German shepherd, you should aware about the way you provide them a care and affection and German shepherd breeders take care of this. This protective, alert and courageous breed requires obedient training, attention and socializing to keep their mind and body active. The benefit of caring and exercise to your German shepherd is that they live a long life and stay a faithful companion for his master. In this article, we try to cover all the beneficial tips that help you in caring for your German shepherd. •If you to take care of your purebred German shepherd puppies then first of all you have to ensure that you are giving him a proper amount of nutrition and protein because they are very essential for him. •As we said that feeding is an important part of caring but feeding your puppy with food according to his is also very important. So, before giving him anything to eat ask the breeder or veterinary about what food should be given at the current age of German shepherd. •Whenever you are feeding your German shepherd, you have to check the correct amount of food according to his size and age. •As an owner of a German shepherd, for better health and result divide the food of your German shepherd into multiple and smaller meals and give them to him throughout the day. •Now, after feeding you German shepherd you also have to take care about his health. You have to take your dog to veterinary for a regular health check-up. •If your dog is ill or sick then provide him all the medical facilities as soon as possible instead of waiting for something else. 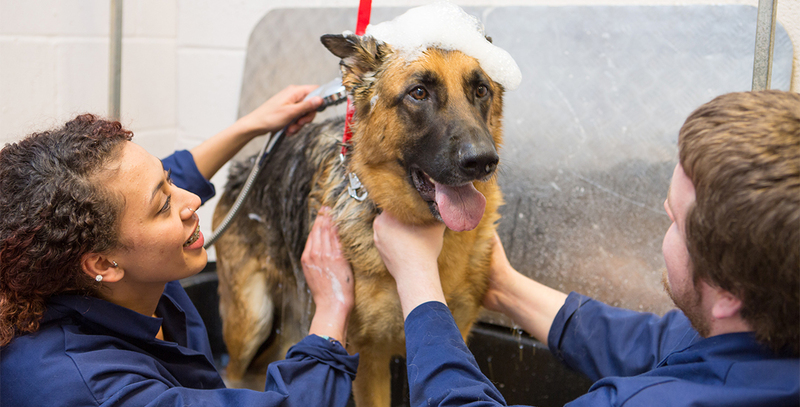 •Provide proper bathing, brushing and trimming to your German shepherd because cleanliness prevents your dog from many diseases. •You have to manage that your German shepherd is getting enough space in the room for playing and walking. •To keep body and mind active, you have to provide daily exercise to your dogs such as jogging, running, walking etc. •Avoid overeating because overeating may lead to having to bloat and this bloating makes your German shepherd lazy. •Take your puppy outside your home, let him meet with other dogs and puppy and let him play with other animals. •If you want to socialize your German shepherd then the best option for you is to train him. Train to German shepherd to socialize him. •Always teach some new tricks and commands to your German shepherd because these commands will make him more active. •And the most important tip is that gives him your attention and love because your dog needs your love, care, attention, and affection.